Gov. Linda Lingle continued to promote Hawaii and mutual opportunities for progress with the people of China at a series of meetings and events in Guangzhou, China. The governor met with Deputy Director-General Ou Shaowu from the Office of Foreign Affairs for the People’s Government of Guangdong Province. Ou reviewed with the governor the remarkable growth his province has experienced in the past few years. Guangdong is now home to nearly 96 million people and extensive construction projects are visible everywhere. Lingle noted 80 percent of the people in Hawaii who claim Chinese heritage can trace their lineage to Guangdong province. The governor and director general discussed the impact of tourism development on the local residents. “If you do what is right for your own people – providing them with clean parks, good roads, clean water and air, shopping options and protection of cultural resources – then these things will also attract visitors,” Lingle said. Ou will be visiting Hawaii in July and Lingle looks forward to sharing Hawaii’s hospitality with him. 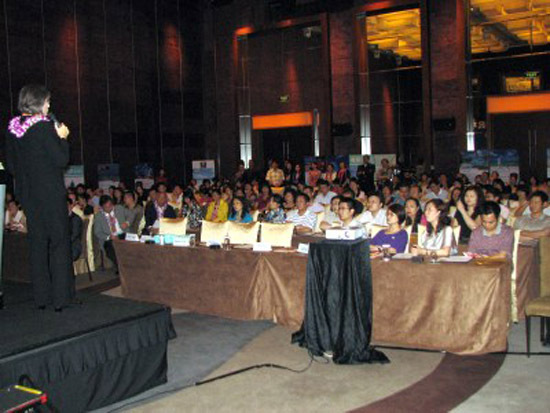 The event was held in the new Grand Hyatt Guangzhou which is managed by David Chan, a graduate of the University of Hawaii School of Travel Management. More than 100 Guangzhou residents were in attendance and learned about the programs Bank of Hawaii has in place to welcome investors. Bank of Hawaii now has reciprocal ATM and credit card arrangements with China Union Pay (CUP) Bank. Bank of Hawaii ATMs will offer Chinese language instructions and will waive money exchange fees. The seminar also provided potential investors with detailed information on how Chinese students can enroll in local educational institutions, how to retire in Hawaii and buy a place to live, and business opportunities in areas such as medical clinics, golf and tennis facilities, and retailing. In her remarks, Lingle noted Hawaii can serve as an entry point for the U.S. mainland and is an excellent location for a headquarters operation for Chinese companies because of our language and cultural ties, as well as being a safe place to do business and live. The governor also had the opportunity to meet Weidong Li, vice general manager of Cruise Travel Television in Guangzhou. He recently completed a ten-minute travel film about Hawaii which was featured at the seminar. The film, which was also shown on Guangdong TV Travel Channel, featured scenes of Oahu, Maui and the Big Island, including dramatic footage of lava from Kilauea Volcano, Hawaii’s surf, and our diverse, multi-ethnic population. Dan Yuan, a member of the 2010 Narcissus Court, accompanied on the ukulele by a member of the Governor’s staff, performed hula to share some of the culture Chinese visitors will experience when they come to Hawaii. Lingle also provided the opening remarks at the Department of Business, Economic Development and Tourism’s (DBEDT) “Invest in Hawaii” forum for Guangzhou business people. More than 130 people attended the seminar at the Westin Hotel Guangzhou to learn more about investment opportunities in Hawaii, including the Hawaii Regional Center Program that offers permanent residency to foreign nationals investing in businesses that create 10 or more full-time U.S. jobs. DBEDT Director Ted Liu, who is originally from Taiwan and lived and worked in China, shared his experiences with the audience of finding many opportunities that resulted in his appointment as director of DBEDT less than five years after moving to Hawaii. This year marks the 25th anniversary of Hawaii-Guangdong sister-state-province relations. Lingle and Gov. Huang Hua Hua of Guangdong Province will meet to celebrate this relationship and sign a Memorandum of Understanding (MOU) to extend relations for another 25 years.